A painting of the Colossus of Rhodes. BY the time you read this, that little exercise of pencilling an ‘X’ on a piece of paper – the little exercise with a big implication for our next five years – will be over. Of course by now you would have had your fill of election speeches. ‘Your fill’ is the appropriate expression. It was like being treated to free dinner after free dinner. Pity about the fares though, basically, they have been about, “I have done these, they didn’t. I can do them, they can’t. I am good, they are bad.” They were just promises, pontifications and predictions dire (if you don’t vote for the speaker). “Aiyah,” said my friend John. “Political speeches are just … er … hot air.” I think he was about to use a more earthy term but checked himself when he realised I could be quoting him. Anyway he went on to tell me a joke about a bunch of politicians who went for a hot air balloon ride. “Are all of you guys politicians?” the ticket seller asked. Okay, we are scrapping the bottom of the barrel for election and politician jokes. So I am going to spare the readers of any more of this rather tedious topic. I am going to dwell on something entirely different: it is about history and salvation. However, if you do note that a couple of figures I quote might seem to have a political implication, that’s not my intention. Are you slightly confused? So, I’d better get started. Let us start with history and the attempt to recreate it. 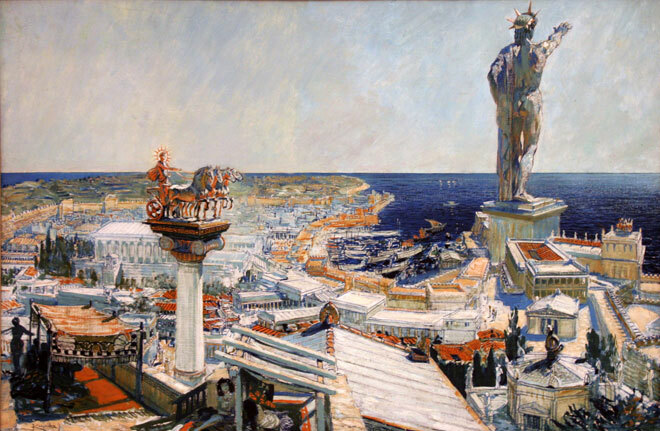 The Colossus of Rhodes was a statue built in honour of the Greek god of the sun Helios on the island of the same name. It was considered as one of the seven wonders of the world. However, it was short lived as it was destroyed by an earthquake half a century later. Now 2,500 years later a company of architects has plans to rebuild it, only this time at 500 feet it is going to be five times higher than the original. It is hoped that the new Colossus will be a tourist attraction, with shops, cafes, a museum and a library, and will also act as a lighthouse. It is an ambitious and futuristic scheme. The outer skin of the statute will be made of solar panels to harness the power of the sun for electricity, which is neatly appropriate. Obviously, such a daring project would cost quite a bit of money. It is audacious by any standard and especially for Greece that went bankrupt just last year. However, it is hoped that the new Colossus would be a tourist attraction to bring in enough money to reboot the flagging economy. So, how much would this grand project cost? It is estimated at 250 million euros. Wow! That is a lot of dough I thought. Indeed it is. Predictably the Greek government is pretty cool about the idea. Well, it is just plain broke. But Aris A Pallas, the architect leading the project, is unfazed. The new Colossus will be paid for by crowdfunding. I did a search about that term. It is the practice of funding a project or venture by raising lots of small amounts of money from a large number of people, typically via the Internet. Apparently “musicians, film-makers, and artists have successfully raised funds and fostered awareness through crowdfunding”. A few things strike me about this news, especially in relation to Malaysia. Firstly about the little matter of bankruptcy: It was reported that Performance Management and Delivery Unit (Pemandu) CEO Dato Sri Idris Jala had warned in 2009 that the nation could go bankrupt by 2019 if the government had continued with its spending patterns then. Yuck! We could go the way of Greece. And do we have a lost monument of colossal (excuse the pun) proportion to be recreated as a money-generating tourist attraction? If we do want to go down that path for salvation I believe we, or rather someone, does have the dough to undertake this venture. You see 250 million euros is about RM1.15 billion. There is a figure that has been bandied around for a few years – RM2.6 billion. That is twice the amount needed to recreate the Colossus of Rhodes. Even if there is any ring of truth in Idris Jala’s dire prediction, we need not panic. We can snap out of that nightmare by putting those zeros that have been so talked about into good use – build two colossi.